Although the majority of our padlocks are top of the range, we also appreciate that there is a requirement for lower cost alternatives. We spent a long time testing and sourcing a range of locks which we feel have a high quality to price ratio and which do not suffer from many of the key problems often afflicting lower cost alternatives on the market. As a rule we would not recommend using our budget range for prolonged outdoor use. 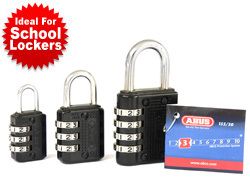 We commissioned this padlock by ABUS especially to be exceptionally reliable, long lasting and anti-pick but at an unbelievable price for the quality to produce the ideal padlock for lockers in schools and gyms! NOT the same as the cheaper identical copies on the market! Available in 30mm and 40mm each come with individual easy to understand instructions. 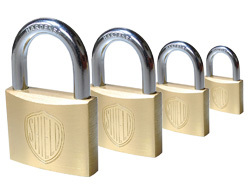 Our Iron locks are an entry level padlock made from low cost extruded Iron. Available in various different sizes to suit a wide range of uses. They also use a hardened steel shackle for added security. 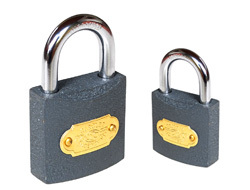 A low cost yet good quality brass padlock from a British manufacturer for general use. Although not manufactured to the ultra high standards of ABUS, the Shield Locks are still excellent and at an affordable price. Available in 4 sizes for a variety of uses.